Java isn’t everyone’s cup of tea. With all its boilerplate and overhead, you’re almost always better off with a proper IDE that handles everything under the hood for you. However, if you learn a new language, you don’t really want to be bothered setting up a clunky and complex IDE. If only you could use a simple, standard Windows program that you are most likely already familiar with. This wish led [RubbaBoy] to create the MSPaintIDE, a Java development environment that let’s you write your code in — yes — MS Paint. If you’re thinking now that you will end up writing your program with MS Paint’s text tool and create a regular image file from it — then you are right. Once set up, MSPaintIDE will compile all your PNG source files into a regular Java JAR file. And yes, it has syntax highlighting and a dark theme. [RubbaBoy] uses a custom-made OCR to transform the image content into text files and wraps it all into few-button-click environment — including git integration. You can see a demonstration of it in the video after the break, and find the source code on GitHub. One has to truly admire how far [RubbaBoy] went, considering the tongue-in-cheek nature of this project. And all joking aside, if you’re interested in OCR, this might just be simple enough to begin with. Or you could expand it with some text to speech functionality. At last! A compiler that can handle this Hello World from Stack Overflow. LOL until I coughed from lack of inhaling! Windows program? What are you talking about? And besides that, no experienced programmer wants anything to do with an IDE, those are crutches for the incompetent. But only a masochist would write Java without something to automate the ≥80% of the code that’s just boilerplate. No, actually professional software engineers and developers use IDEs since it makes their lives easier, especially when they have to deal with multiple projects that depend on each other and with hundreds or even thousands of source code files. It saves them valuable time. No, actually professional software engineers and developers don’t let friends program in Java. Actually we do, if Java is the appropriate tool for the task its use is encouraged. 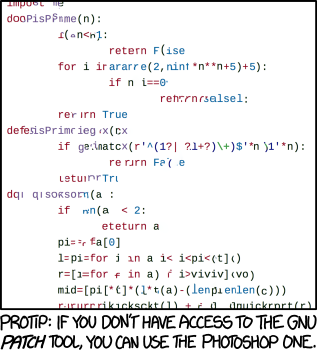 What do you let yours friends program in? and what do you use if not an I.D.E? The original IDE. Accept no substitute. I actually like IDE’s, but I totally agree with your Windows sentiments. Every time I’m forced to use Windows for something, I have an immediate urge to take a shower. Even more so if it’s Windows 10. Coding aptitude of siths has yet to be demonstrated. Neat project. I learned Java in school and wasn’t sure compared to C/C++… then found I couldn’t easily translate the MATLAB app into C/C++ so dealt with the MATLAB Component Runtime compiled apps, created a new GUI to tie all the apps together and create some more functionality with VB and since was working on my second B.S. that was more focused on business studies and I was doing leadership work that wasn’t the leading cutting edge tech in a highly demanding World competition… the added time for the system to run seems or seemed to keep people busy… or me at least at the time and still save and make money. Way to go! Ah, Java. The COBOL of the 2000’s. That is the wittiest comment I have read on here in months. Well-played. Only a techie/geek of a certain age really gets the truth of that. Notepad would be much better…. I raise my for INSCAPE converted to blender….. This is SO cringy, and completely useless.